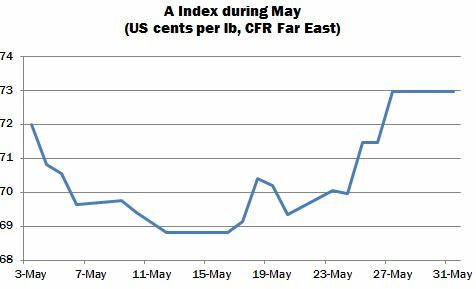 International cotton prices moved in an unclear direction during May, with the A Index dipping to a low point of 68.80 US cents per lb on May 12, and reversing direction to close the period modestly above its opening value, at 72.95 cents per lb. 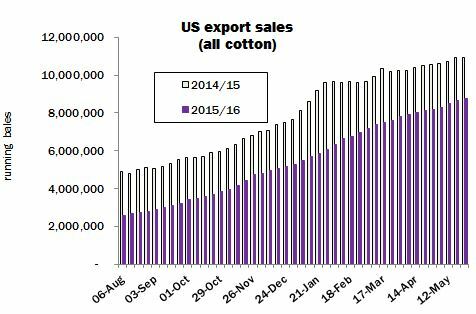 The pattern of mill buying remained concentrated generally on cotton available nearby, with spinners in need of cover buying in a gap-filling fashion. An upturn in demand was witnessed during the early part of the month, before prices began their rally. Particular attention was paid to higher grades, with Australian and available US lots finding active buyers, as the extent to which better grade Northern Hemisphere crop supplies were becoming depleted came to light. However, the deeply entrenched caution with which mills have approached the market during the past several months failed to abate, and many spinners remained tentative buyers, particularly when prices began to rise, under the lead of New York, during the second half of the month. Replacement costs at various origins also strengthened during the period. On India’s domestic market, asking rates for Shankar-6 reached several new seasonal highs. West African ‘s’ styles were approaching a sold out position, and the origin asking prices for Brazilian 2015 crop, as reflected by the Esalq Index of spot values, remained conspicuously firm, in reflection of a depleted available supply. May saw the long-awaited and much discussed resumption of sales from China’s massive state reserves. Auctions began on May 3, under heavy turnover that reflected Chinese spinners’ tendency to run down their inventories in advance of the state reserve sales, which was accentuated by a delayed start. A few days into the process, the volume of cotton sold had already exceeded the volume disposed of during the entire process during July and August of last year. By the end of May, over 500,000 tonnes had been placed with buyers, representing a quarter of the total volume which is being made available in this year’s auction series. A promising, if moderate, inroad was thus made into Chinese stocks, though the unsold volume in Chinese government warehouses was estimated at roughly eleven million tonnes before the auction series commenced. Therefore, even if mill demand remains sufficiently strong for the two million tonnes earmarked for sale by the end of August this year to be disposed of, a huge volume (around nine million tonnes) would remain in government hands. Despite the lengthy period of conjecture that preceded their commencement, once the state reserve auctions were under way, little tangible impact on world cotton prices was discernible. The unexpected strength of demand meant that the prices paid at auction were firm. Thus, paradoxically, the early stages of the auction process coincided with an upturn in Chinese import demand, much of which was directed to Australian cotton. The most desirable lots of imported cotton offered via the auction series (including Australian) did not represent a cheap option, and those with access to import quota thus turned to the international market. In the longer term, it remains to be seen to what extent access to state reserve cotton will contribute to the continued improvement of Chinese spinners’ international competitiveness, and whether the strength of local mill demand will be maintained as the auctions continue. Largely as a result of reduced demand from China, US export sales during May continued to lag behind the pace of last year, though the discrepancy narrowed slightly since our last monthly market review, and at the time of the latest report, a shortfall of around 2.3 million running bales was in evidence. Turkey has continued to feature prominently in export reports, despite the government decision made during April to impose a three percent anti-dumping duty on imports of US cotton. By the week ended May 19, this season’s US export sales to Turkey (all cotton) stood at around 1.55 million running bales (almost 350,000 tonnes), of which 350,000 bales (80,000) remained to be shipped. This season’s other major destination for US cotton is Vietnam, for which export were similar in volume to those to Turkey, up to late May. Foreign-owned spinning enterprises (amongst which Chinese mill groups are prominent) have recently accounted for roughly two thirds of Vietnam’s raw cotton imports (from all sources). In this connection, it is interesting to note that Vietnam was the largest supplier of cotton yarn to China during March and April, having overtaken the two other major exporters to that market, India and Pakistan. In its May statistical estimates, USDA reduced its forecast of this season’s exports by 500,000 bales (480 lbs), to nine million, which would represent the smallest figure since the 2000/01 season. As a result, projected ending stocks on August 1 were raised to four million bales, the largest carryover since 2008/09. The May report also included Washington’s first detailed forecasts of supply and demand during the 2016/17 season. US production is forecast to rise by nearly 15 percent to 14.8 million bales (480 lbs), against Cotton Outlook’s figure equivalent to just over 15 million. 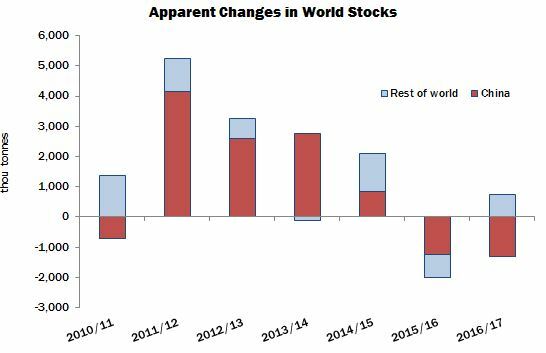 USDA forecasts that the larger output will only partially be absorbed by higher exports (10.5 million bales), with the result that a further rise in ending stocks, to 4.7 million bales, is forecast by the end of the 2016/17 season. During the remainder of the month, New York futures appeared largely indifferent to the bearish signal implied by these numbers. By the end of May, planting in the US had fallen behind schedule. Beltwide, 59 percent of the crop had been planted by May 29, against a five-year average of 69 percent. The shortfall occurred principally in the important producing state Texas, where wet weather had interrupted field work. However, the moisture has been viewed as beneficial on balance, since it should enhance yields and serve to limit the scale of abandonment. As a result, many observers take an optimistic view of the production outlook. USDA’s initial forecast, and our own figure, are thus probably at the lower end of private expectations. Elsewhere in the Northern Hemisphere, planting advanced during the month, and by its end crops in several major producing countries were in the ground. As yet, no major setbacks have come to light, but less than ideal growing conditions have been in evidence in some regions. In India, sowing in the irrigated Northern Zone was virtually complete by late May, while work in other, rain-fed areas will not begin in earnest until the Southwest monsoon, on which cotton is reliant, brings seasonal rainfall. The Indian Meteorological Department has forecast ‘above normal’ rainfall in 2016, and many global weather models have echoed this opinion, which should result in higher output, and therefore a larger exportable surplus. However, at the time of writing the monsoon is around one week behind schedule. Of greater potential concern than that delay is the possibility that pest attacks will again affect the crop. Reports of whitefly have emerged in Punjab, where crop damage was sustained in 2015, while bollworm was also a significant pest in several parts of the country last season. Despite these potential negative influences, for the time being our production forecast anticipates improved yields, compared with last season. In Pakistan, where sowing also expanded, production is expected to recover (by almost half a million tonnes), and a reduced requirement for imported cotton is therefore envisaged. However, as in India, some apprehension is expressed with regard to possible insect pressures, with the result that these early assessments, as always, remain tentative, and subject to change. Cotton Outlook’s estimate of global supply and demand is little changed on the month, as production has been altered only modestly, while consumption has remained steady. The expectation remains that world stock levels will fall in China, but that a significant increase in stocks (of the order of 750,000 tonnes) will take place outside that country.